Pastor: Rev. 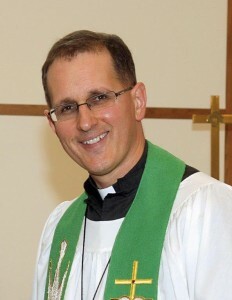 Jonathan Rathjen began serving as pastor of Trinity Lutheran in March 2001. Before becoming a pastor, he worked in the oil industry in Casper, Wyoming. He graduated from Concordia Seminary in St. Louis, Missouri, in August of 1995. Later that same month, he was ordained and installed as associate pastor of Peace Lutheran in Hutchinson, MN. Pastor Rathjen‘s wife, Lisa, is a nurse at Peru State College. The Rathjens have three children. Heidi is a student at Doane College and Micah is a student at the University of Nebraska - Lincoln. Hanna attends Auburn High School. Pastor Rathjen enjoys bicycling and music.